Steer your own sailing vacation with our bareboat catamaran charters. Your family and friends will enjoy private sailing adventure aboard your selection from our diverse late-model catamarans. As a licensed skipper, you can set your own itinerary and time tables. Want more time to relax while on vacation? On any of our bareboats, you can add a captain, chef, or provisioning. Add all 3 and enjoy an all-inclusive crewed charter aboard any of our bareboat catamarans. Most often, your captain’s resume should include sailing experience on a similarly sized catamaran. You will find it more comfortable and safe to have a crewmember of similar experience. NauticEd Bareboat Sailing Series can help you prepare to refresh your knowledge on anchoring, navigation, maneuvering in tight areas, and other key aspects that will keep you and the boat safe and sound. 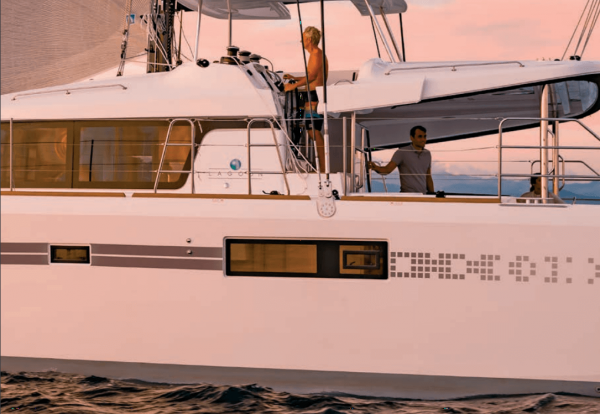 Many bareboat catamaran charter skippers find it helpful to hire a captain for the first 2-3 days to get specific boat handling information as well as learn more about the local area.